WAKEFIELD, Mass. 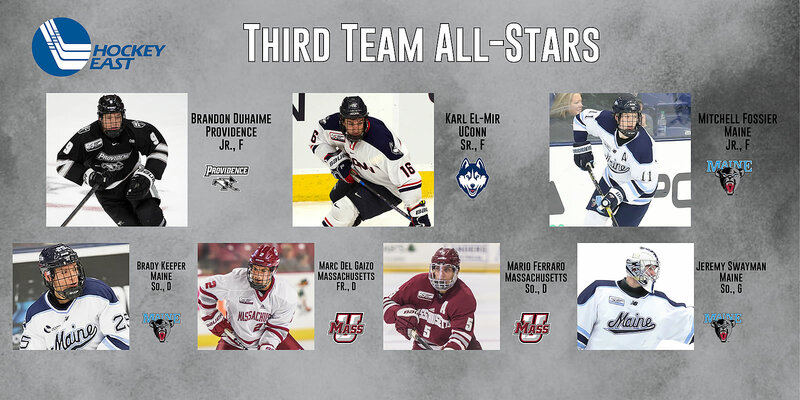 - The Hockey East Association has announced its three 2018-19 all-star teams as voted by the league's 11 head coaches ahead of the 35th Hockey East Championship, March 22 and 23 at the TD Garden in Boston. 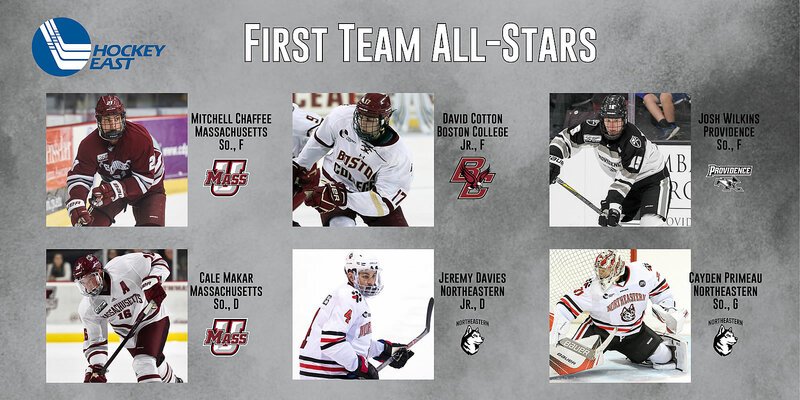 The six Hockey East First Team All-Stars represent four different schools and include goaltender Cayden Primeau (Voorhees, N.J./Northeastern), defensemen Cale Makar (Calgary, Alta./Massachusetts) and Jeremy Davies (Sainte-Anne-de- Bellevue, Qué./Northeastern), and forwards Mitchell Chaffee (Rockland, Mich./Massachusetts), David Cotton (Parker, Texas/Boston College), and Josh Wilkins (Raleigh, N.C./Providence.) Makar was the lone unanimous selection to the first team. 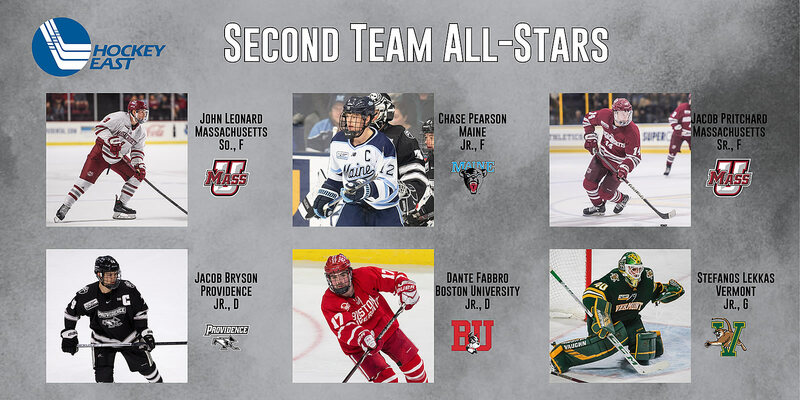 Also gaining acknowledgment from the league coaches are Hockey East All-Star Honorable Mentions in Hayden Hawkey (Parker, Colo./Providence), defenseman Casey Fitzgerald (North Reading, Mass./Boston College) and forward Tyler Madden (Deerfield Beach, Fla./Northeastern). Alongside his first-team honor, Primeau was also named the Stop It Goaltending Goaltender of the Year. 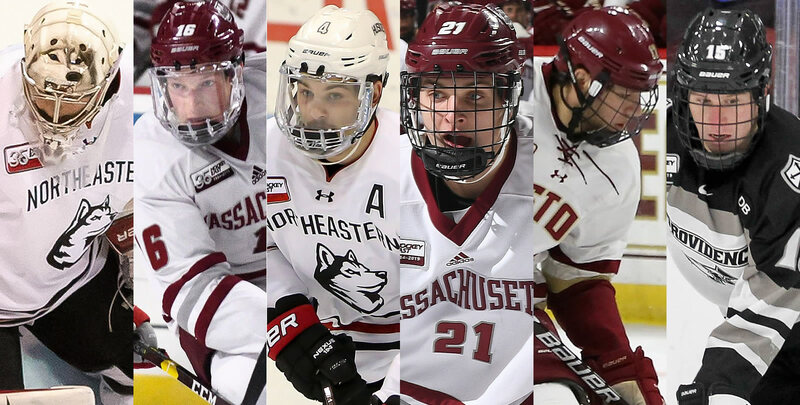 The 22 honorees represent eight of Hockey East's 11 member institutions while 11 can be seen competing in the 35th Hockey East Tournament championship set to take place this weekend, Friday, March 22, and Saturday, March 23, at the TD Garden in Boston. No. 3 Northeastern will square off with No. 5 Boston University Friday at 4 p.m., while No. 1 Massachusetts and No. 7 Boston College take the ice at 7:30 p.m. The winners advance to Saturday's championship tilt at 7 p.m. Fans can purchase tickets online at Ticketmaster.com or by calling 800-745-3000.